The Traders have come to visit Ancenstry VIII! Awesome! Mark II Radar Jammer will help tremendously at making Ancestry VIII more autonomous/care free. And no more wasted salvage. This thing costs 10 million metal so whenever I have excess metal I'll just turn it on and it will take care of that problem. First waves afer the CPA and the AIP increases brought by it are massive. Both of them hit Ascs G20 at the same time. Thankfully the ZSEs weren't inside a Carrier so I managed to focus them down before they got in range of anything. 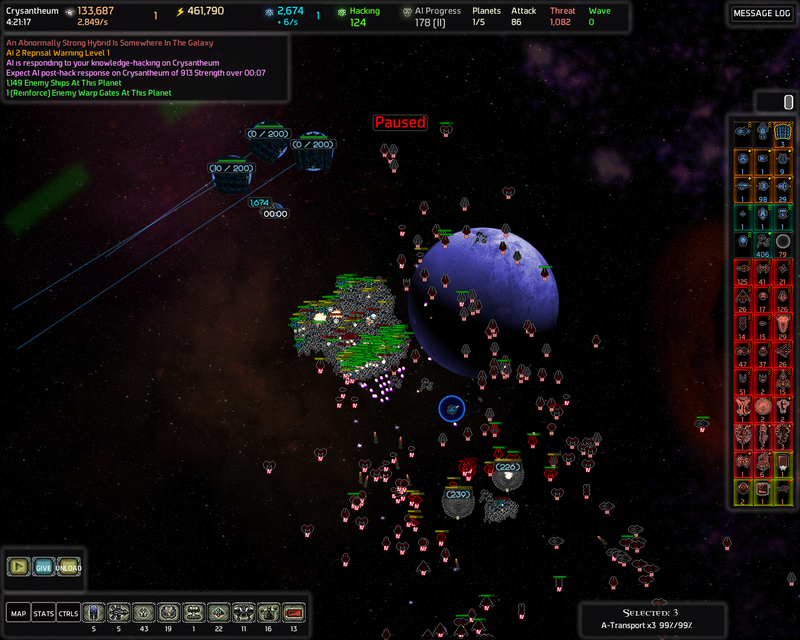 Needler Turrets make quick work of the AI Plasma Siege Starships.. while I'm focus building all of my own Plasma Sieges with a capful of Mark II Engineers. These are just normal waves now. 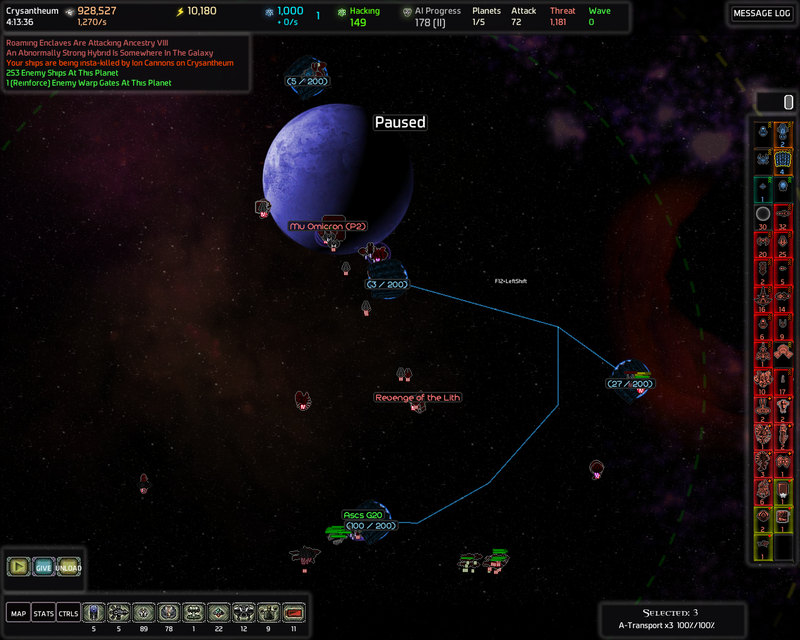 There's also quite a few Mark III AI ships too so things are starting to get fun now. Surely there were some Mark IVs and Mark Vs in the exos and the CPA but those were clearly the minority. Now off to knowledge hacking Crysantheum. Before I can start the hack I need to get rid of those 4 Ion Cannons. Going to send 3 Assault Transports. 2 with 1 Mark I and Mark I Plasma Sieges with 5 Munitions Boosters and one with 3 Mark I Raid Starships and 5 Munitions Boosters. Going to do my usual limburger infested raiding trick. Take a loaded Assault Transport and park it right next to the target. Pause the game and unload. Tap the pause very fast. As soon as you see the ships come out of the transport pause again and order them to attack the targets and return to the transport by holding shift. And get out. Job well done. 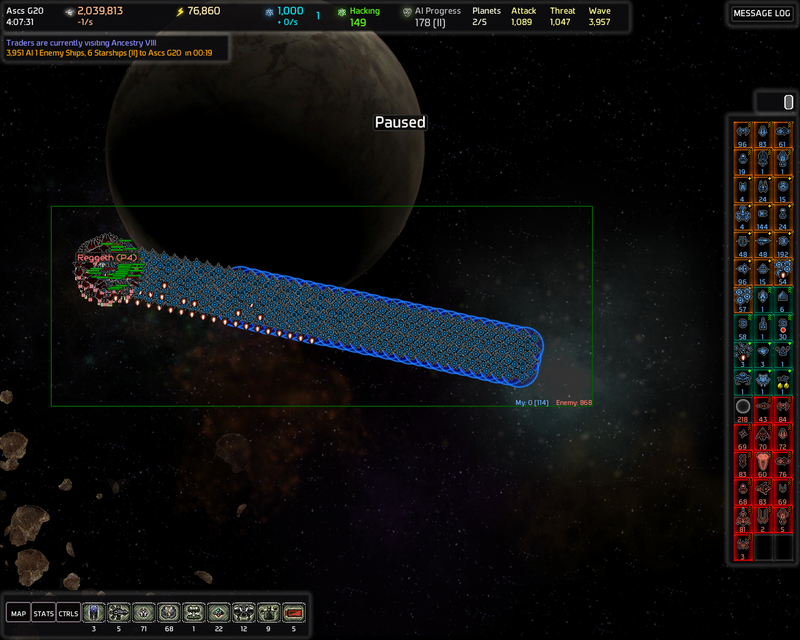 Raid Starships are excellent for this since they and their projectiles move very fast. Plasma Sieges are a bit more clunky. Ok now I'm ready to build the beachhead. Split my whole fleet between 2 Assault Transport and filled the third one with the Hacker and 24 Mark I Engineers, 58 Mark II Engineers, 20 Mobile Builders and 43 Remains Rebuilders. Unloaded all Assault Transports and paused immediately. The very first things I did was focus builded a Counter Sniper Turret. Then I placed everything else and am going to focus build 2 more Counter Snipers, Mark II Gravitational Turrets and Force Fields. Then everything else. And by everything I mean everything. Aaand the beachhead is ready in roughly 35 seconds. I wonder where those Mark III Fighters came from.. I hope they're not the Special Forces..
..yeah, they're the Special Forces. 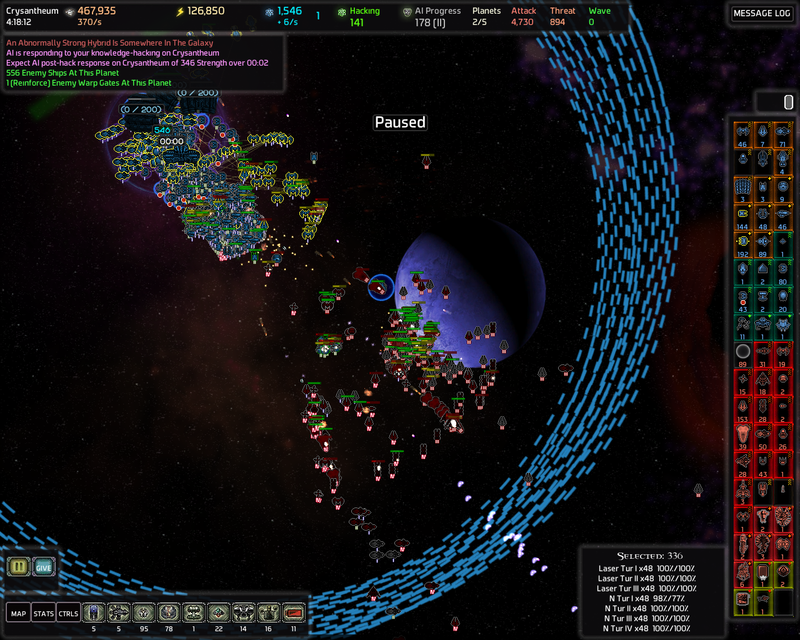 75 Riot Control Starships. I actually don't think that's going to be a problem since I'm in a defensive position and there doesn't seem to be any Missile Guardians or things like that. My Needler and Laser Turrets will shred the Riots to pieces. If they were any other Starships I'd be dead. Good thing most of the Fighters are gone too. And as you can see I already started the hack. I'm pretty confident I can finish the hack either before the rest of the Special Forces arrive or I'll be able to repel them because they arrive in order of movement speed from highest to lowest. I still built some new Assault Transports so I can get away if things get too hairy. Also, two waves were announced and both of them have about 3k ships. Great. I might have to relocate some of these Mark II Engineers to help defend against those waves. 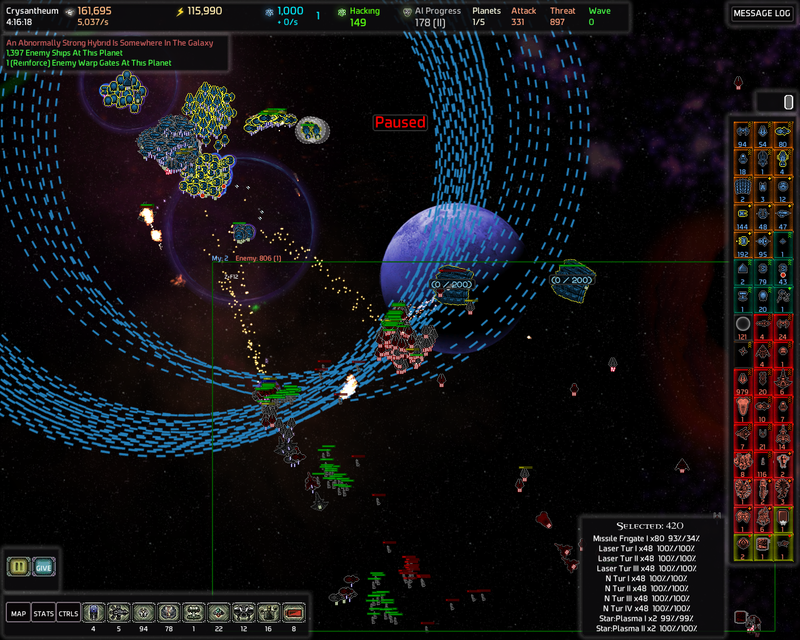 Bwahaha 75 Riot Starships destroyed in 58 seconds. Welcome to the meat grinder AI. As I predicted, easily cleaned up. Once again: This is what I mean I say "beachhead it!". Good thing I built those Assault Transports. The rest of the Special Forces arrived with Carriers and it was too much for this beachhead. 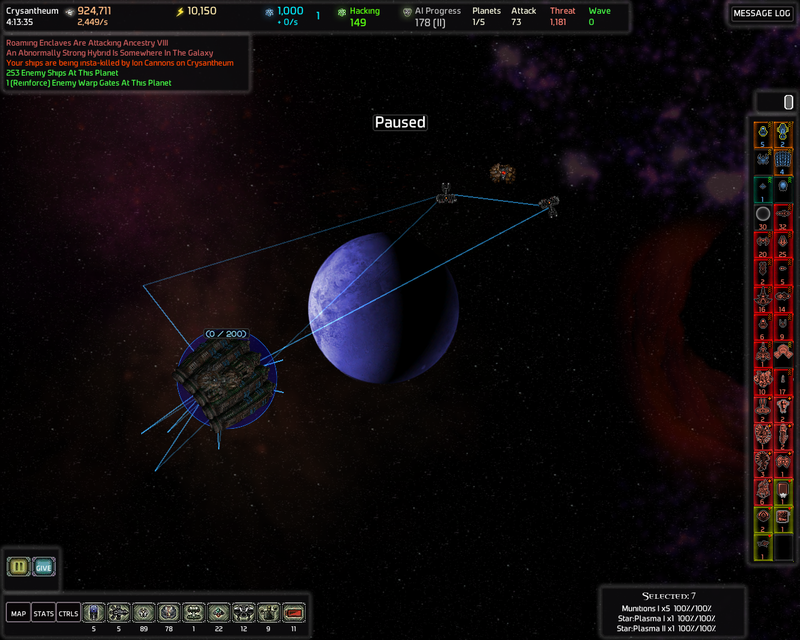 Especially when I had to scrap half of the Engineers and rebuild them on Swog. I'm going to leave the hacker there to do it's thing as long as possible and do another hacking run if it doesn't get to 3000 knowledge. Beachheads are partly meant to be disposable.. except that this beachhead was so big it triggered a reprisal. Wonderful. At least I softened up those Carriers quite a bit. The other one had 1000 ships and the other one had over 900. Will Continue from there tomorrow. Off to sleep. Yeah it has come time to quit this game. This game has become so tedious and micro heavy that I longer want to try continue this. 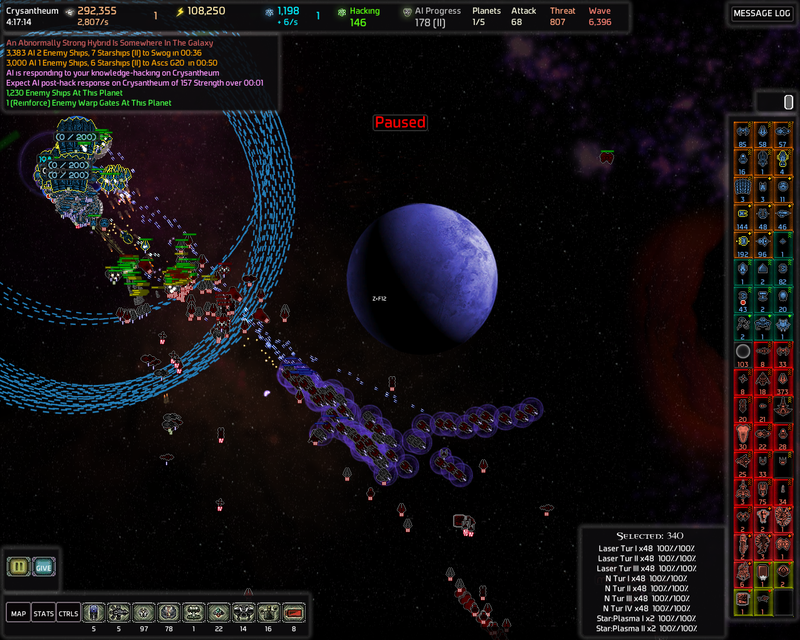 All the Zenith Siege Starships, Munitions Boosters and Force Field ignoring units were too much. Never going to play against ZSEs and Vorpal again! Unfortunate and anticlimatic but I kind of saw this coming. 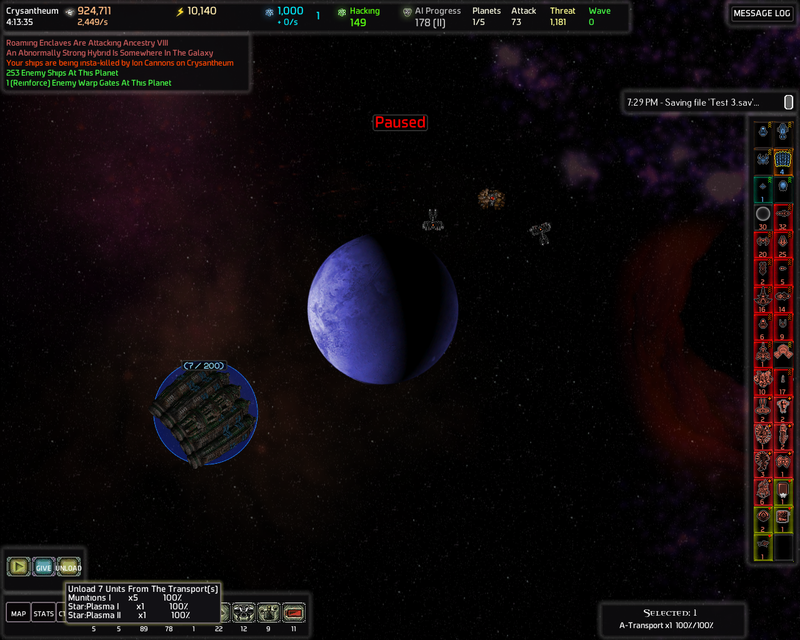 Oh well, I died a glorious death and took a lot of AI's ships with me. I may or may not start another AAR with a bit more normal settings. Ancient Shadows disabled and normal or simple ship types. Aptly put. They were my cryptonite indeed. And so was the Vorpal. Yea, I'm looking forward to balancing the sequel around the idea that your forcefields actually do their job without things that ignore them or do damage through them. If I did that in AIWC without other major balance changes you'd just walk all over it, but with per-planet power, etc, it should be much more workable. Yeah I'm looking forward to AIW 2. I haven't had the time to follow the discussion much but I think the changes I've heard about sound good. The rest probably comes down to balancing. Good stab Kahuna, and thanks for the AAR of it. I'm still boggled you made it as far as you did against those types of mechanics... I can almost see keith twirling a moustache while read through it, heh. It will be interesting to see / test the mechanics in II once they've been re-done / tweaked. Honestly, I found the writeup very informative and educational. Thanks. Good stab Kahuna, and thanks for the AAR of it. Thanks good to hear. My goal is to always explain what I'm doing and why. What's the rationale, how it's going to benefit me and how am I going to execute it strategically/tactically in practice. But just going with the flow really and putting my thoughts to words. I started another one today. I know this particular AAR was doomed from the start because of the setup, but there's always that part of me that believes with enough time and ingenuity, most anything is possible. Even with cheese, if necessary. What if you added golems? I noticed that in your latest game and in this one, I don't see a lot of toys from the expansions on *your* team. I don't see any spire jumping, for example. I don't see golems or champions (not that I like champions). I'm just thinking, maybe you need to activate one of these expansion events to get that extra firepower you need to win. I think a lot of people underestimate the danger of the Artillerist AI type. Zombards, ZSiege Engines, Sentinel Frigates, Snipers, all supported by high-mark Munitions Boosters? One of the most annoying games I ever played was against an Artillerist / Reservist combo. 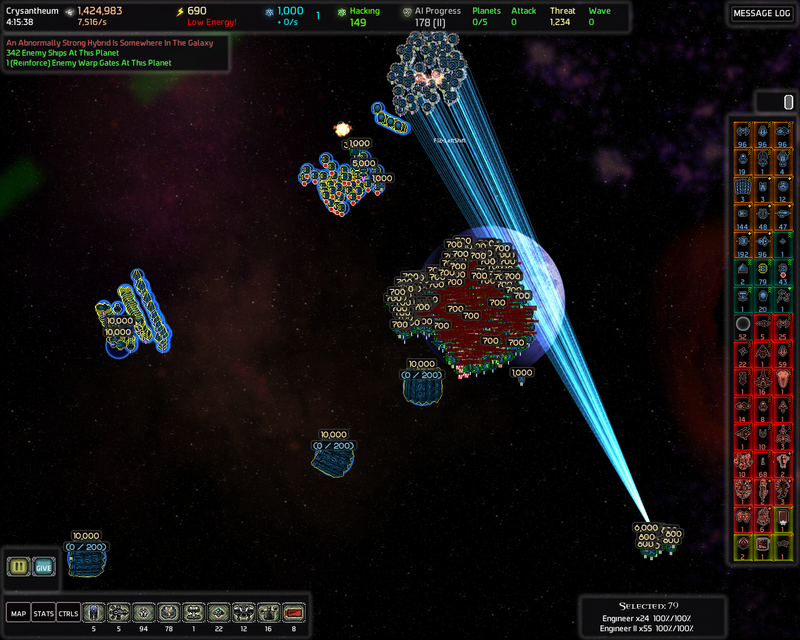 The alpha from AI fleets gets so powerful that even superweapons can be one-volley'd. I'm not sure anything but cheesing Champions (alt-progress 10 and no Nemesis) could have helped him. Yeah I've really taken the "You are outgunned. You are massively outnumbered." part to heart. Golems I like and I think I should try to finish my current game as fast as possible and start a new one with Golems. Spirecraft are pretty cool too. Champions I don't like. 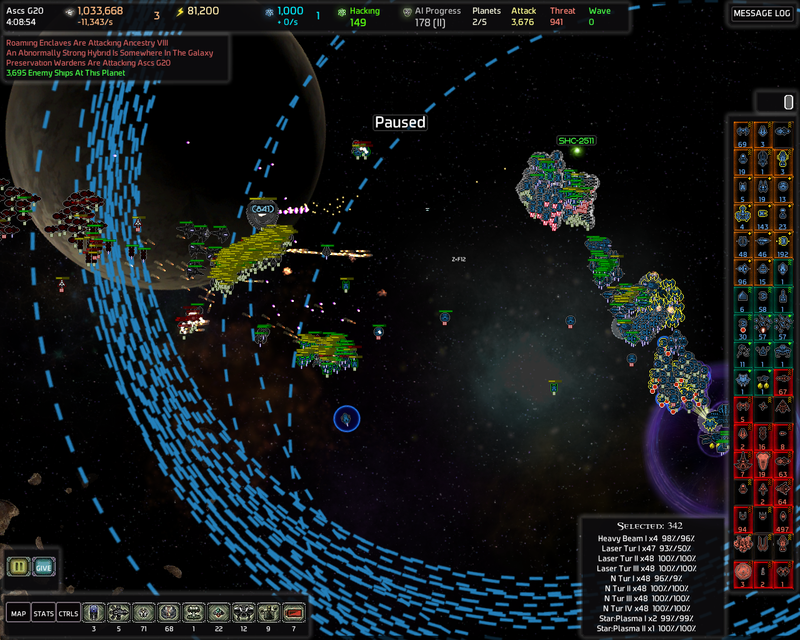 When it comes to countering the exos or attacking AI Homeworlds I think Spirecraft are much better. Or at least they were. I actually haven't played with Golems after all of their stats were.. doubled? Tripled? Anyway Golems are better for defensive purposes in general. Tractoring, paralyzing and destroying the ZSEs with a Black Widow Golem could work. Hive Golem would absolutely obliterate all ZSEs and everything else too. It would probably eat a CPA too. Unless there's Gravity Guardians or Spire Gravity Drains, then Give Golem would be useless. But there weren't so it would have worked. Botnet Golem would obviously slaughter (or reclaim) everything even if it was safely sitting under a Force Field. Cursed golem does 1600*60=96000 damage every other second so it would destroy 2 or 3 Mark III ZSE every second. Not even close enough. Black Widow Golem would also destroy about 2 or 3 every second but it would instantly disable 200 of them. I could then tractor them out of range and destroy their engines, put the Widow in stand down mode (to shut down the tractors) and fly back and repeat. Armored Golem would destroy about 5 Mark III ZSEs every second. Although in all attacks the AI had close to hundred Zenith Bombards which make even Golems melt pretty quickly. 100 Mark II Zombards do 728000 burst damage against Ultra-Heavy. 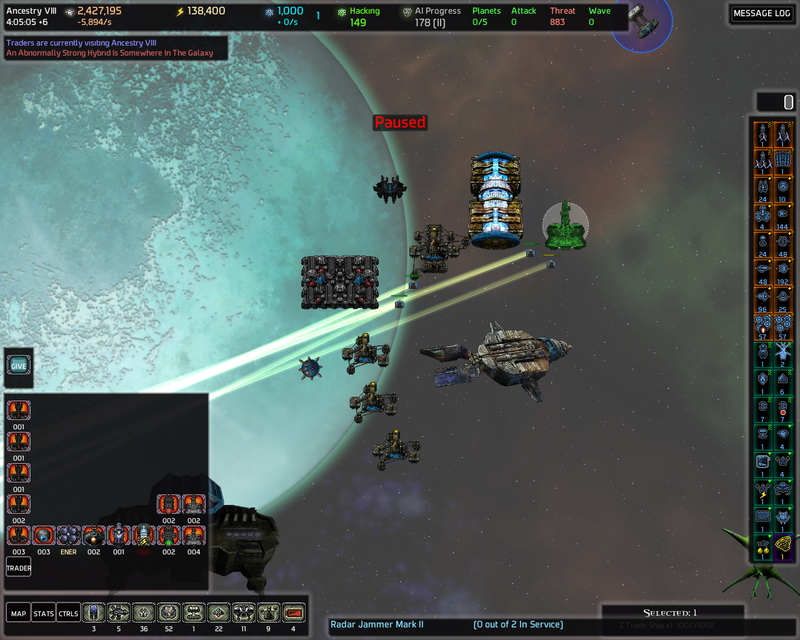 Also I actually forgot to try to use Riot Control Starships with tasers to counter the ZSEs. I think the taser paralyzes all ships in it's range. Another tactic that might work would be to spam Doom Shrooms at the ZSEs to keep them paralyzed buy me more time to actually destroy them. I too think it could be possible with some combination of these tactics and enough time (irl). I also think Artillerist is surprisingly scary. On the other hand now that I think about it it's not that surprising. Surely snipers can be countered with Counter Sniper Turrets but that's only on your planets and beachheads. 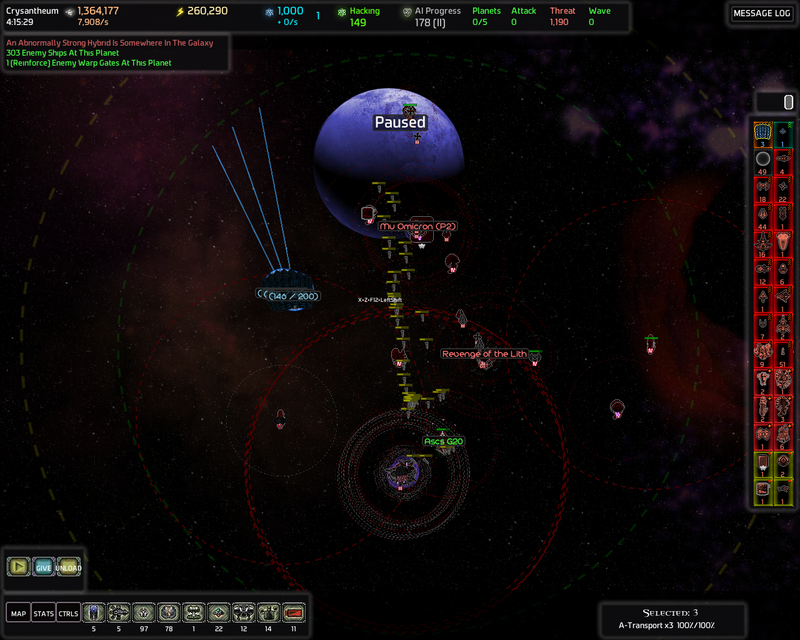 All long range ships tend to accumulate into massive threat fleets over time. They're always behind everything else so they're most likely to survive when the AI starts retreating. Which leads to hundreds of Mark II+ Zombards and snipers hanging around on AI planets. I think another underrated AI type is Cowardly. That's because Cowardly isn't as likely to feed it's ships to your meat grinder defenses and give you salvage and it's probably going to accumulate huge amounts of threat. Imagine something like RaidEngine/Cowardly as one AI. Or Artillerist/Cowardly or Artillerist/SpeedRacer.. (RaidEngine/SpeedRacer! ) Yeah there are a lot of crazy combinations. Anyway. It could be possible to manually move the Golems under Force Fields whenever you see a lot of Zombards firing at once. Force Fields are immune to Zombards' ammo type so the Golems could also be repaired while they're protected by a Force Field.